M.G.N. 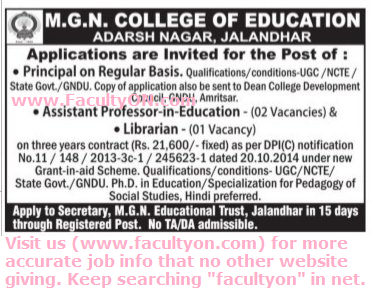 College of Education, Jalandhar has advertised in the TRIBUNE newspaper for the recruitment of Assistant Professor / Principal / Librarian jobs vacancies. Interested and eligible job aspirants are requested to apply within 15 days from 11th July 2018. Check out further more details below. College Profile: Montgomery Guru Nanak College of Education, Adarsh Nagar, Jalandhar was founded in the year 1955. It celebrated its Golden Jubilee in 2005. MGN College of Education is one of the most prestigious institution which was established in the year 1955 with B.T. class. When the college was established, it was then, known as Montgomery Guru Nanak Basic Training College. Dr. Harnam Singh, Retd. DPI (Colleges), Punjab, was the founder Principal of the college. In 1967, in response to the general directive of the Panjab University. Qualifications: As per UGC / NCTE / State Govt / GNDU norms. Ph.D in Education / Specialization for Pedagogy of Social Studies, Hindi will be preferred. How to Apply: Interested and eligible candidates are requested to send application along with CV, copies of certificates and recent PP size photo to the following postal address. Apply through registered post.